You will enjoy (or have enjoyed) Mr Henry Sire's book Phoenix from the Ashes (see earlier posts) because of its dry and cutting wit. "Modernists shrink from beauty like a vampire from holy water". "If words were sufficient to bring men to him, God would not have needed to become a man and die for us; he could have founded a newspaper." 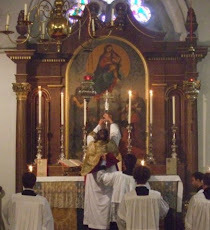 " ... in the new rite, the Mass has become a lecture delivered to the people by the priest, with the altar as his lecture table." This last observation, of course, is along the lines of the criticisms levelled against modern liturgy on the grounds of its 'Enlightenment' ancestry; its didactic nature, its intellectualism, its linear avoidance of repetion. I have in mind particularly the writings of Dr Aidan Nichols OP and of the Anglican Catherine Pickstock, who has very acutely written about the 'oral' nature of traditional liturgy, its repeated beginnings and its "liturgical stammering". But you get a particular bite in Sire's book which, I think, comes from the facts that he writes from outside the 'professional liturgist' 'community'; and writes as a layman. "In an ordinary Mass today, the sense one has is not the offering of an eternal sacrifice but a lecture conducted by the priest and two or three women of the public-librarian class, to whom the readings and other duties of the church are allocated. The verbosity and preachiness of the liturgy is itself a middle-class characteristic with which many ordinary parishioners feel little rapport; and the alienation of working-class worshippers, in a way that was never true of the old Mass in poor parishes, has become a peculiar feature of the liturgical reform." I agree with that sentiment, except that my own instinct would have been to put the last word of that sentence into inverted commas. Indeed, if one desires to waste the money, one can see all this illustrated weekly in the house-journal of those who, through the desacralised finger-wagging wordiness of the modern rite, have been enabled to to intrude upon it and to assert their own personal power over the Church's worship; a desired status which they very accurately see is threatened by the authentic Mass ... I refer, of course, to the weekly called the Tablet. It is the culture in which endless and endlessly daft songs (whose mummies sent them out into the world beautifully dressed in choruses) and questionable intercessions take up time which is then recouped by the use of a most improper Eucharistic Prayer. The Eucharistic Prayer is, of course, the only part of the new rite which speaks of Sacrifice and implies a sacrificing Priesthood; and which in this great mystery links Heaven and Earth as the Incarnate Word is offered to His Father in a propitiatory oblation. So, of course, if it can't be eliminated entirely, it has to be made as perfunctory as possible. At this point, I would add the briefest and humblest footnote to Mr Sire's admirable demolition of "Eucharistic Prayer II". This prayer is taken from a very ancient Roman prayer by Hippolytus. Except ... current scholarship is convinced that this identification, widely accepted in the 1960s, is completely wrong. The document concerned is less ancient than was thought; did not originate in Rome; and has nothing to do with Hippolytus. Sire's already cogent argument is thus made very much stronger. I append a repetition of my own translation of the description offered by Fr Louis Bouyer of the seedy origins of "EPII". Good Father, may I ask which scholars/works show that 'The Apostolic Tradition' is not by Hippolytus nor originated in Rome? I'd love to do some more reading on the matter. Thanks for all you do! But this is "the big deal:"
I am terribly impressed by your review of H J A Sires' book, which I am currently enjoying. There are all manner of things of which I am just now becoming enlightened thanks to his scholarship. I also very much enjoyed your attachment with your translation of Bouyer's fine (?) work. I have to admit that I have been laughing out loud in my quiet little home, and hoping my neighbors don't think I'm crazy, if they can hear me through the walls.....You do have a way with words, Father! Sire is an historian (hooray!) and although he is making a polemical case for the restoration of tradition he uses the methods of the historian rather than those of the theologian or liturgical 'expert'. In particular, he criticises Pius X for his measures against Modernism which were unduly influenced by Italian conditions. One of the most perceptive passages in the book. I forgot to mention one other, more general, source: Paul F. Bradshaw, *The Search for the Origins of Christian Worship: Sources and Methods for the Studt of Early Liturgy* (Oxford University Press, 1992, 2nd ed., 2002). It is available far more cheaply than the other book which I mentioned above: *The Apostolic Tradition: A Commentary (Hermeneia: A Critical & Historical Commentary on the Bible)* by Paul F. Bradshaw, Maxwell E. Johnson, and L. Edward Phillips; ed. by Harold W. Attridge (Augsburg Fortress Publishers, 2002). "Hermeneia" appears to be the series of which this work is a volume. Storm in a tea cup. Nothing will change, but perhaps only get worse, there will be no return to tradition, small or large T. Outside of a small group, perhaps like ourselves, the overwhelming majority of Catholics are quite happy with the banality of the Mass as celebrated in the vast majority of parishes today. Those unhappy with it have long since left or simply quit coming. And with this new fellow in Rome, if anything changes, it will most likely be in the opposite direction than a return to tradition. And as his visit to the United States so amply emphasizes, kitsch and the papal cult of personality are not only popular, it sells. Ah, Dale, but things do change. When I moved back to Massachusetts in 1996, the Archdiocese has one Latin Mass at Holy Trinity, which almost none knew about. While Holy Trinity has been closed, there are now 5 churches where the 1962 Missal is regularly used, and 2 parishes of the Anglican Use (one Pastoral Provision - today celebrating its 18th anniversary - and one Ordinariate). Not a full restoration, by any means, but in perhaps the diocese with the lowest of low churchmanship within the Catholic Church in the US, it is a great change. And not because of hierarchy, but because of people who desire to worship in the beauty of holiness and the holiness of beauty. But when are the Ember Days? Was 1963 the last decent vintage?